Disaster has struck the normally peaceful village of the Ninchas! Their precious pearl of knowledge has been stolen! Master Yocha, head of the village, sends Nincha, the lucky cat, and his new friend, a young Dragon named Lupishu, off on a journey through the Ninchana world to find their pearl. In Ninchanese, you are the one who needs to save the Ninchas and become the dragon yourself! You play a baby dragon who needs to learn Chinese to save the Ninchas. 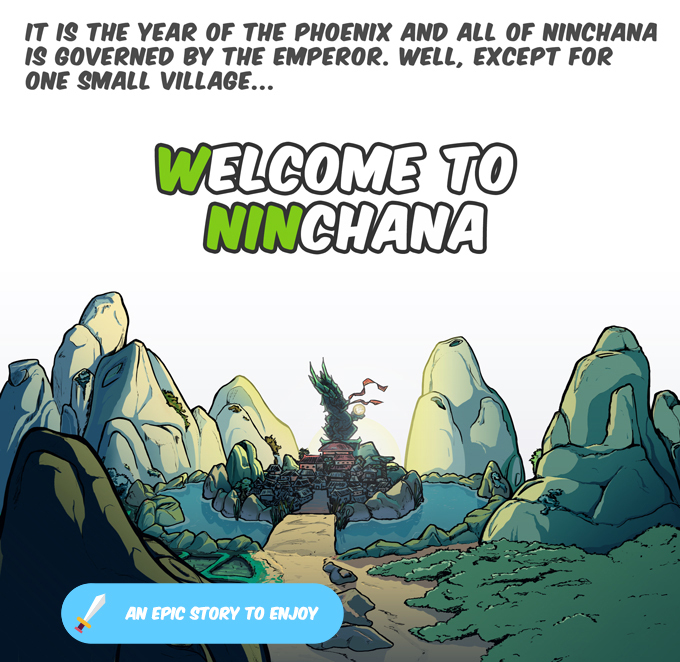 The story in Ninchanese is an integral part of Ninchanese and every part as important as the tools implemented in the application to learn Chinese effectively. 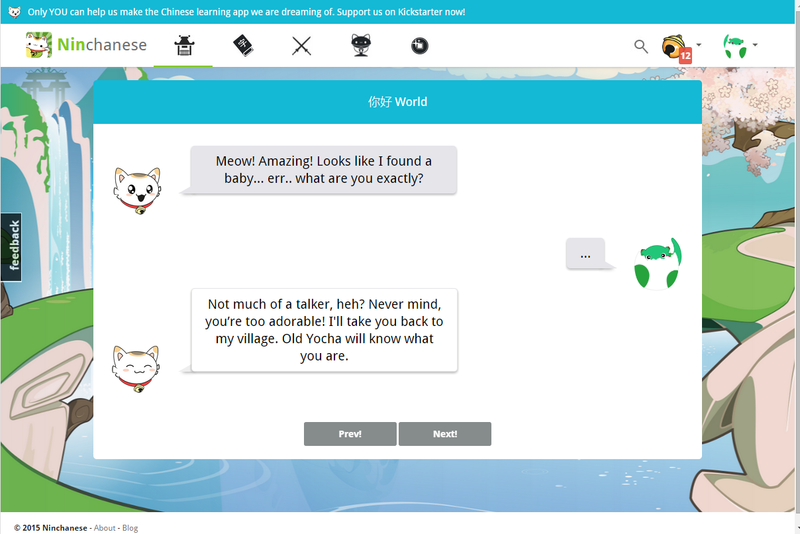 On your journey searching for the pearl of knowledge with Nincha and Lupishu, you’ll discover a new way of learning Chinese, which is full of cats and fun. You’ll also have to face bosses. Never be afraid of them, because during the six worlds of adventure that await you, you’ll level up your Chinese by memorizing vocabulary, speaking dialogues, and understanding Chinese grammar. The story, which we want to be engaging, helps the learners discover Chinese culture and lets them feel closer to the characters . The storyline also gives the learners the chance to identify themselves as Lupishu, and see themselves grow as an adorable dragon, as they improve their Chinese and become increasingly better at Chinese. The story parts are crucial for the learners: they help give them purpose. The story shows the learners (whatever their age) the path to learn Chinese and gives them a clear goal, like Lupishu: learn Chinese and recover the pearl of Chinese knowledge. The narratives put the learners in a situation where they feel confident, gives their brains a break so they are in the right mindset and more inclined to learn something new. The storyline emotionally engages them and gives them positive emotional experiences, which contributes to increased retention. The story is also a great way to express positive feedback and celebrate progress, two crucial elements to help the learners progress and stay motivated. For the learners, it means something to progress from one stage to another, and then to beat a Boss, guardian of the next world. It is a real indicator of progress. It drives them to achieve, so they can feel proud of themselves and confident in their ability to speak Chinese. And if their motivation to learn Chinese were to waver — they’ll want to keep going because they want to know what happens next to Lupishu and what boss they’ll be meeting next. Isn’t it amazing to find the dragon in you and level up your Chinese? Don’t hesitate then, time for you guys to save the Ninchas’ world and be a real hero in studying Chinese with Ninchanese! If you are interested in learning more about gamification and the use of storytelling in learning, this recent article by Alice Keeler is very interesting. Ninchanese combines addictive game mechanics, cute cats and efficient Chinese learning techniques to make learning Chinese a lot of fun! Now live on Kickstarter! The app is now in beta so sign up now for early access to the beta! Check out our trailer and stay in touch with us on Facebook, Twitter, Google + and Pinterest.